A young phenom no more, D Trucks straddles genres with one authoritative guitar. "I hate most jazz guitarists," a friend of mine says, "because they all sound too cool for their own good -- the treble turned way down and their amps clean as a whistle as if they were afraid to really play the blues." Amazingly true. For an antidote, there are only a handful of mainstream jazz players who occasionally bust loose. And, increasingly, there is Derek Trucks... who, while not really a "jazz" player at all, may just satisfy your craving for smart, sweet runs and earthy explosion. Mr. Trucks started his career as that tired cliché: the young guitar phenom. The nephew of Allman Brothers founding drummer, Butch Trucks, Derek has long been channeling Duane Allman and a certain kind of open-ended southern jam approach to the fret-board. But his first album -- an eponymous effort on a small label -- was an instrumental set covering the likes of Miles, Coltrane, and Wayne Shorter. And while his career since then (including playing with, who else?, the Allmans) has hewed back toward the blues-rock jamming that is his heritage, there remains a pure-player excitement about his honest, astonishing solos. Derek Trucks -- slide guitar in hand -- is a more exciting and authentic "jazz" guitarists than most of the cats who actually go by that label. The gem in the discography of The Derek Trucks Band is surely Live at Georgia Theatre, a two-disc explosion of brilliant, soulful (live) playing. It's the glorious compromise between the band's tendency toward jazz and world music and its blues 'n' roots-meets-southern rock base. Live, however, has had limited distribution. And so arrives Songlines, which resembles Live's reach and tone without actually being "live". It may be the next best thing to being there. It says something that Songlines starts with one of Mr. Trucks' most unusual favorites, an abbreviated version of "Volunteered Slavery", a tune by the blind and ingenious jazz reedman Rahsaan Roland Kirk. The Live version is expansive, but here the tune serves as a quick introduction to "I'll Find My Way", a mid-tempo soul tune featuring the DT Band's new-ish vocalist, Mike Mattison. Mr. Trucks, if you don't already know, is the band's star as its guitarist but -- Carlos Santana-like -- he hands off the lead vocal chores to bandmates. Indeed, the Santana comparison extends to the whole band concept -- driven by percussion and organ as much as guitar, this is a band that mines both blues and international flavors in forging a distinct hybrid identity. Like Santana's '70s bands, the DT Band courts a loose-limbed feeling. Just as "Volunteered Slavery" segues easily into "I'll Find My Way", the latter tune folds into the old tune "Crow Jane" featuring a pinched falsetto vocal over a funky/Latin blues groove. Mr. Trucks slide guitar solo here is barely eight bars but killer. And so the Santana comparison also runs afoul -- as Mr. Trucks plays more melodically and with infinitely more blues feeling than Mr. Santana. Despite his Allman roots, Mr. Trucks seems less like a jammy guitarist than like a guitarist capable -- but not reliant on -- building melodic ideas atop each other. "Sahib Teri Bandi/Maki Madni" is a live favorite with a serpentine Indian-sounding line for guitar, organ and flute in unison. Kofi Burbridge's flute is tasty, but the gut-wrenching slide solo over a slow pedal point has you screaming "Uncle!" Sure, compared to the Live version, this one seems unnecessarily tame, but such is the fate of the studio versions of live favorites. The studio sound is kinder to the blues and soul work. For example, "Chevrolet", with Mr. Trucks' dobro as sloppy and glorious as you could want it, has real Delta grit and energy, and "I'd Rather Be Blind, Crippled, and Crazy" plays as a relaxed Neville Brothers groove filtered through Motown. Similarly, "Sail On" has an easygoing funk that doesn't seem pale even though it is thoroughly studio-processed. Both tunes have the charm of good arrangements (some sneaky clavinet, some tasty, ear-candy background vocals) and features Trucks-a-rific solos that snap at the chords and get gritty enough to balance out the slickness. Maybe the best two tunes are the most hard-driving and the most reflective. "Revolution" (written by Jay Joyce, the producer here) starts like a blues then surges into a rocking anthem of a chorus. When Mr, Trucks plays between the choruses, the band seems as big as all of E Street but with a hundred times more Delta credibility. "This Sky" has a lovely guitar introduction then glides into an uncharacteristically breezy melody, pushed along by irresistible snare-clicks and a flute counter-melody. It the not the kind of tune that the Derek Trucks Band is ever going to be famous for, but it signals plainly enough why it is a great band. Led by a firebrand blues-rock player and chopsmith, this is a band with artistic ambitions well beyond simply giving DT a place to show off his licks. It would seem to be time for Derek Trucks -- signed to a huge label and (along with his wife, guitarist and singer Susan Tedeschi) the subject of recent articles in national publications -- to break out. He's not merely a blues guy, and his jazz-level appeal is not capped by long solos or lyric-less flights of virtuosity. Plus he's leading a true band -- one that plays together with superior unity and drive. How about it... a band led by a non-singing guitar-slinger with "impeccable taste" that never leads to noodling or fake-jazz pleasantries. Is it possible? 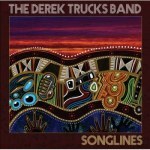 Songlines says it is.